What Are Magnetic Bracelets Made Of? How Are Magnetic Bands Made? IonLoop bracelets are made using only the highest quality of materials to ensure consistent performance throughout your daily activities. 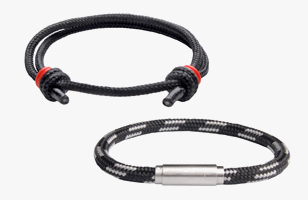 We offer a variety of magnetic bracelets comprised of different materials including medical-grade silicone, braided leather, nylon, powerful magnets, and our special negative ion producing minerals. Our magnetic bands are crafted in the USA using two visible magnets placed inside a clear casing. To increase the magnetic potency even further, we reverse the polarity of the magnets before inserting them into the bracelets. Magnet Therapy: What Do Magnetic Bracelets Do? What do magnetic bracelets do? We’re glad you asked! Magnets have been around since the beginning of time and were first discovered thousands of years ago. Ever since their discovery, scientists have researched the effects of magnetic energy on the human body. Researchers have found that magnets may have a pain-relieving effect when used as a form of therapy. Other benefits that have been associated with magnets include improved circulation and relaxation. Scientists know that magnetic fields are everywhere. In fact, the earth is one giant magnet field and so is the human body. It is only logical to say that magnets may influence our chemistry. If you’re interested in learning more, check out our testimonial page where you can find many positive reviews on how magnets have helped customers who wear our bracelets. Are Magnets Safe to Wear? As popularity of magnetic jewelry has increased over the years, more and more people are asking the question: “is it safe?” According to proponents of magnetism, there are no known side-effects of wearing a magnet. However, it should be noted that magnetic energy can affect our body’s in difference ways. When you first put on your bracelet, you may notice the following: tingling, dizziness, or a warm sensation. It’s believed these effects are caused by an increase in circulation and balancing of your own magnetic field. If at any time you feel uncomfortable, you should immediately remove the bracelet. Note: Women who are pregnant and individuals wearing medical devices that are susceptible to magnets, like a pacemaker, should not wear jewelry that is magnetic. You will love our products! coupon must be used in 72 hours...the clock is ticking!